Since I started this journey over a year ago, I have rarely been tempted in a beer bar to order the same beer again when there are dozens of beers on draught or in the bottle I have yet to try. But the North Coast Brewing Red Seal Ale turned out to be an evil little temptress. The beer has a distinct coppery red coloring. The beer is on the creamy side, but don’t take that as a sign of weakness. The applehopped malt flavor revels in its pale bittery bite. The 5.5% ABV is also a nice little surprise. 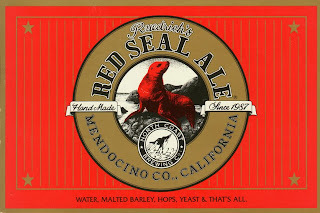 So after finishing up the Red Seal, I did move on to a new beer as my second choice, which you’ll read about in a few weeks, however I did succumb and order the Red Seal again for my third beer. it while unpacking some boxes. Do you think this beer is still good? You snooze, you lose, Knight of Saint Arnold, I am taking the vaunted 100th review spot. And the Mayflower Pale Ale is well deserving of this honor, because it epitomizes the essence of this crusade, which was to try and find as many good beers that are out there. Sure I can go into most liquor stores, pick up a six pack of Beer Crusade's lone Hall of Fame Beer, Dale's Pale Ale, but where is the fun in that? I want to find the next Hall of Fame beer. 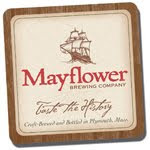 Mayflower Pale Ale is good pale ale. It has light bitterness, good malt flavoring, solid citrusy tones and a decent 4.9% ABV. It's a good beer for pretty much anytime, not too heavy, not too light. It's a safe choice and safe choices like this get a 3.0. I am sure you expected a Hall of Famer or a Zero for number 100, but honestly you just can't pick Hall of Famers by looking at them, if you could I am sure there'd be a lot less 2.0s on the blog. A quick recap of the last 99 (in order), and yes I know some of the pictures stink. I am ok with it, why aren't you? Quick show of hands... who out there likes beer? If your hand is raised, and it really should be as you're reading a blog all about beer, then listen up! I found a humdinger of a beer tonight. Red Barn Ale, made by the folks at The Lost Abbey, is truly a delight. Apparently it's a saison style beer, which means it's traditionally low in alcohol content to refresh farm workers during the harvest season (thank you wikipedia). Well I'm not a farm worker, but it is creeping up on the harvest season, and this beer was very refreshing. It comes in a champagne style bottle, cork and all, and when poured it's a very near perfect golden color, along with a nice healthy amount of head. When I first opened it and took a sniff, it immediately smelled like one of the Beer Crusaders home brews, which isn't always a good thing (we drink when we brew sometimes, you do the math) but this had a wonderful smell. The aroma of hops and yeast hit me immediately, and produced an "eight year old on Christmas morning" smile on my face. When I finally stopped smelling it and had a sip, I realized just how near perfection this beer was. Not perfect, but close to it. The spices immediately jump out at you, but doesn't overwhelm your pallet, which is a very fine line. At 6.7%abv, it's not exceptionally potent, but who cares when it tastes this good. Overall, I'm giving this beer a very strong 4. I wasn't really expecting much from it, but was very surprised and will most definitely purchase another bottle in the very near future. Sometimes, a good thing can also have unintended consequences. For example, the trend in the past 5 or so years is to make "extreme" beers, with massive quantities of hops and malts, leading to huge, robust flavors in every sip. The downside of this extreme beer movement is that older beers, made in traditional styles, tends to seem weak by comparison. 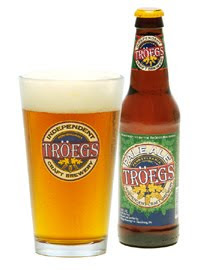 The Pale Ale from Troegs Brewing Co. is one of those traditional beers. While it is a great example of a pale ale, it seems like it is stuck in the past. 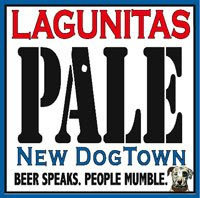 It doesn't have "hops that will make you pucker", or "more malts than a bakery" or "so much alcohol we can't sell it legally". 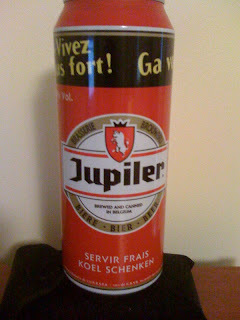 Instead, it is a refreshing, classic beer, and I definitely was impressed. It comes in at 5.4% ABV, with an attractive straw yellow color and a fresh, clean aroma. It ranks very high on the "drinkability" scale, with an easy-drinking taste and nothing offensive. You'll probably want to enjoy more than one of these beers. Octoberfest beers are one of my favorite styles, and the 2009 Octoberfest beers are starting to arrive in stores. I'm going to start concentrating on Octoberfest. Let me know in the comments if there is a particular favorite of yours that I should try. When I think of Brooklyn, or if I were ever to think about Brooklyn, the last thing to come to mind would be sweet floral goodness. But here comes Brooklyn Brewery dropping off its Local 1 offering on us. The Local 1 was gifted to me, which for all of you out there know, is weird because I am not a Belgian Guy, in fact I mock most Belgians for their Pot Pourri foul taste. So this beer definitely had a strike against it. Of course, being free wasn’t bad, and the fact it had a sweet label was good enough for me. Well, those things and the fact I was going to a BYOB restaurant. The BYOB restaurant is a bit tricky with its corking fees and well the stigma if you walk in with a sixer of Keystone Light, you not only get labeled as trash, but as an alcoholic because who drinks six beers at dinner? So I thought by bringing the Local 1, with its corked top and fancy label, people would be fooled into thinking it was champagne and thus looking at me like I was some sort of classy guy. Also it’s like 3 beers in one gigantic bottle, and more like 6 with it’s ABV at 9%. The ploy definitely worked, although I was charged that stupid corking fee. The aroma of the Local 1 is a sweet grape smell. The beer appears light in its coloring, and after sipping you realize the beer is effervescent and not as light as it appeared. The Local 1 has some giddyup in the malt flavoring. As I mentioned above, this beer isn’t fooling around and is packing some serious alcohol content. The taste is crisp, yet not as fruity as the aroma indicates. There is a heavy yeasty taste with fruit languishing about. There is an old Hemingway saying "Always do sober what you said you'd do drunk. That will teach you to keep your mouth shut." 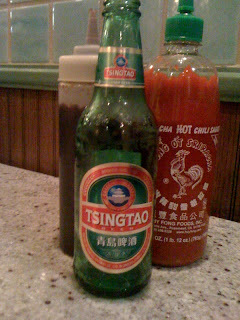 I should have kept that in mind a few nights ago, as I opened the menu at dinner I boldly proclaimed that if they had Tsingtao, I was ordering it. Now I thought this was a safe bet because Tsingtao is from China and I was in a Vietnamese restaurant, but lo and behold apparently the Vietnamese love them some Tsingtao. I was surprised by the Tsingtao, it was actually very flavorful for a mass produced lager. It's almost like they didn't use the malt and barley for 1,000 production runs and only used it for 200, or perhaps I just got a lucky bottle and the malt and barley was fresh. Essentially, it is similar to every lager you've had in the states except it had some flavor, kind of like in a Coors Extra Gold kind of way. So the Tsingtao was decent, but nothing special. If I had a choice between Miller Light and this? I'd probably order the Miller Lite, because in this Economy you should "Buy American", although Miller Lite is now owned by South African Brewers so.....I guess when between the two, just order what feels right. The Tsingtao has a 4.8% ABV and gets a pretty solid 2.0 rating. Just had to post this on the heels of KSA's brilliant Sierra Nevada Porter review. But I just read an article that two of our favorite brewers are collaborating on 2 beers. Dogfish Head and Sierra Nevada are joining forces to brew two special beers this fall. Distribution will be limited, so keep an eye out. You can learn more here: Guess we have to make that road trip to Chico after all? 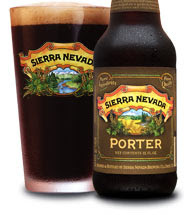 So when I came across a "new" Sierra Nevada Porter recently, I was excited to try it. I figured that it would be terrific, and I was right. It is very much what a porter should be: dark brown color, flavors of smokiness and chocolate, a touch of hop bitterness. ABV of 5.6%, which is appropriate for the style. This is a great beer. Here's the funny part: Sierra Nevada has been brewing this beer for 25+ years, and I've had it plenty of times before. But the label was recently redesigned, leading to intense confusion on my part. The current label can be seen to the left, and the old label is here. I think the new label is a big improvement. The beer is still fantastic. Who's up for a trip to Chico, CA for the brewery tour? Anyone else out there a fan of Blue Moon? Well, anyone else besides you Sargent Crowley... To me, a nice cold Blue Moon on a warm summer's night usually hits the spot. Tonight however, that was not the case. I'm dog sitting for my brother, and I don't really know the area, so I don't really know where the good liquor stores are. I had to hit a smaller store with less of a selection and this was the only brew they had that I hadn't had before. Last time I make that mistake. When first opened, you're hit with a rush of citrus scent, so I'm thinking this is a good thing. My first sip was flavorful and I actually thought I could taste a hint of honey. Well I was sadly mistaken. A quarter of the way thru the bottle, the citrus disappeared and I was left with a Coors Light, which was very disappointing. So I thought I'd try a second bottle, thinking maybe it was just the one I tried. Wrong again Kemosabe. The same thing happened here. At 5.2%abv, I couldn't even manage a buzz either. All in all, this beer ranks a very unsolid 1.5. I'm a fan of Blue Moon, so I had high hopes, but all I got was a cheap Coors Light. Very sad. Wachusett Brewing Co. in Massachusetts is definitely best known for their Blueberry Ale. It is their best seller and arguably their flagship product. They do make some other beers, many of which are worth a taste. One of the newest products from Wachusett is Ryde Beer. Its made in a rye beer style, where rye is used in addition to grains and hops to create a unique flavor. It clocks in at 5.0% ABV. It is a pretty good example of the style, with a slightly sweet flavor and the sensation of lightness or freshness. But rye beer itself is not terribly popular, and this beer is a decent example of why that is the case. Mostly, the beer is "just there". There is nothing thrilling about it, really. It is easy drinking and not at all offensive, but that's not saying too much. I got this beer in a Wachusett mixed 12 pack, with Country Ale, Blueberry Ale, and Green Monsta Ale (which was reviewed last year). Everything but the Ryde Beer was well above average. But then, almost every mix pack has a sub-par component. Welcome to goodness my friends. 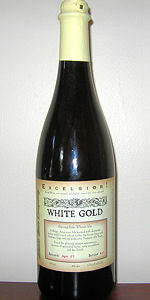 I had a bottle of Excelsior White Gold the other day and it was pure joy. It's packaged in a wine bottle and brewed by the Ithaca Beer Company. When first poured it's a golden color, but it gets a little darker as the sediment flows around your glass (be careful when pouring as there was quite a bit of sediment in my bottle). Plenty of head led to a very flavorful taste, with a slight lemony/fruitful smell. If you're a fan of the Harpoon IPA, then you'll definitely like this, as it takes that flavor up a notch. Each sip went down very smoothly, ensuring that I'll soon go out and buy another bottle. At 8%abv, there isn't a huge kick to it, but it sure got the job done. I mean, since it comes in a wine bottle, once it's opened you might as well drink the entire bottle, right? It would be wrong not to I suppose. I'd give this brew a solid 3.5. Very tasty, and I won't hesitate to buy it again, but to me it was more of a summer beer, so I probably won't be picking any up this winter. I highly recommend you try it though, as you will not be disappointed. So that makes two excellent beers in a row for me. Well, after the Clamato Incident I deserve it. Not sure what I'm going to try next week, so if you have any suggestions, fire away.